Kastelorizo (Greek: Καστελόριζο - Kastelorizo, offeecially Μεγίστη - Megisti) is a Greek island an municipality locatit in the sootheastren Mediterranean. It lees roughly 2 km (1 mi) aff the sooth coast o Turkey, aboot 570 km sootheast o Athens an 125 km (78 mi) east o Rhodes, amaist hawfwey atween Rhodes an Antalya an 280 km (170 mi) tae Cyprus. 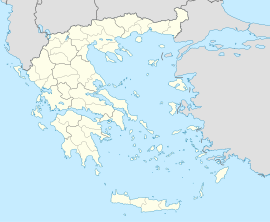 Kastelorizo is pairt o the Rhodes regional unit. The meanin o its current offeecial name Megisti (Μεγίστη) is "biggest" or "greatest", but at anerlie 11.987 km2 (5 sq mi) in aurie, it is the smawest o the Dodecanese. The name, housomeivver, refers tae the fact that it is the lairgest o the sma airchipelago. 3) 'rizo', bein the actual Greek wird 'rizon' maintained throughoot the centuries, meanin "ruit", as researched bi Greek Historian I.M. Hatzifotis (1996), tae signify the "tree ruits" o the fuithill whare the castle wis biggit. It haes gane bi several different names in its history, includin Kastellorizo (Greek), Castellorizo (Greek name wi Italian spellin), Castelrosso (Italian, meanin "Red Castle"), Chateau Rouge (French translation o Italian name) an Turkis: Meis, or Kızılhisar, the umwhile derivin frae the island's offeecial name in Greek, the latter meanin Reid Castle, a translation o the Italian name.